Every person ages differently. When it comes to saggy or droopy eyelids we often think of ways to replenish this early sign of aging. The skin in the upper eyelid may begin to droop and the lower eyelid puffs up with excess fat. Whatever the case may be, we have a solution to help improve the appearance of your skin with minimally invasive techniques of correction. Los Angeles and Beverly Hills clients may feel a little too weary when it comes to invasive procedures which is why our well-rounded facial plastic surgeon has perfected the non-surgical eyelid lift to treat sagging skin and remove excess fat without use of a scalpel. Most patients seem to be confused about the development of droopy or sagging eyelids, but there are only four significant causes for them to lose youthfulness such as age, eye infections, nerve disorders and injury. Eyelid drooping in most cases is medically termed ptosis which is the natural process of aging that makes our eyelids appear thinner over time. During middle adulthood is where we are most likely to see the effects of aging and our eyelids start to droop as they thin out. Nerve disorders and infections also play a role in the underlying layers of skin. The skin is continuously aging, but with the layers of skin already losing firmness and elasticity this contributes to loose skin in the lower eyelid region. Although we are constantly exposed to pollutants, risks of injury and infection, and natural aging we are capable of reversing droopy and sagging eyelids. Achieving the relaxed and refreshed look without invasive surgery can be done with a combination of Botox or Dysport and dermal fillers such as Restylane. 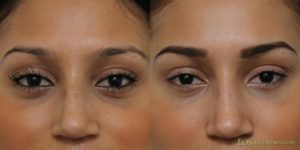 The patient seen above is a young woman who had Restylane placed in the bottom eyelids to remove puffiness and dark circles from under the eyes. She also had Latisse done to improve the length and fullness in her eyelashes. Restylane is one of the FDA approved dermal fillers designed to smooth wrinkles, sculpt and shape facial contours. It is a synthetic gel comprised with hyaluronic acid, a natural substance found naturally in our bodies to hinder the effects of allergies. After the solution has been injected to the site, it slowly binds with the body’s water weight and maintains volume for up to six months. To find out more information about reversing the effects of aging eyelids and other aging skin issues, please call our office in Beverly Hills to schedule a consultation at (310) 772-2866. Your solution to youthful and rejuvenated eyelids is here, call us today.